Hacienda Tres Rios Resort Sets Economic Example through Ecotourism Practices. 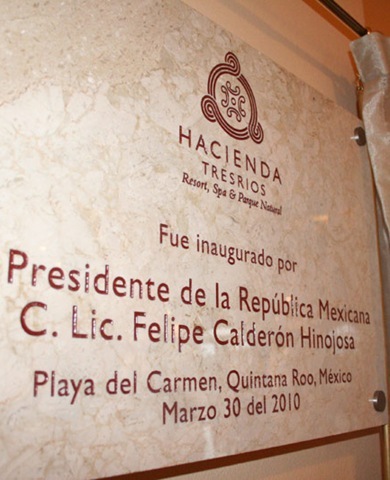 With a message emphasizing the importance of economic growth through ecotourism, the Mexican President Felipe Calderon Hinojosa unveiled the inaugural plaque at Hacienda Tres Ríos Resort, Spa & Nature Park marking the official opening of the eco-friendly Riviera Maya resort. 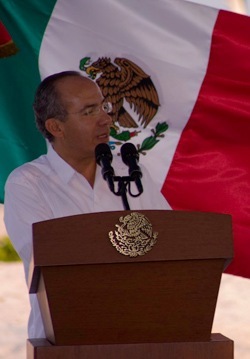 President Calderon congratulated the Tres Rios Group for the completion of the ecotourism luxury complex which generated more than a 1,000 jobs during the first stage of construction and an additional 1,000 for its daily operation. Calderon reiterated the importance of “finding the equilibrium between tourism developments with the environment in which it sits,” he stated, pointing out the resort’s best environmental practices. With an economic profit of 30 million dollars this year and through its eco-friendly initiatives, the resort has become a leader in sustainable luxury development. As one of the first green resort in Mexico, Hacienda Tres Rios Resort continues to lead the country by enhancing tourism development and growth without sacrificing the environment conservation initiatives that have distinguished the all-inclusive resort. Congratulations to HACIENDA TRES RIOS RESORT!